You can have my Kwanzaa when you pry it out of my cold dead fingers. So Christmas is over, you know what that means... IT’S TIME TO GET YO’ KWANZAA ON! Oh man! I can’t wait! All the Kwanzaa parties. Attending the Kwanzaa Festival. Getting stuffed on all that Kwanzaa loaf. The Kwanzaa parades. (I’m sure your city has one.) Seeing all the local businesses decked out in Kwanzaa decorations. Waiting for the second night of Kwanzaa when Kwanzie, the Kwanzaa Sprite, comes in through your kitchen window and Kujichagulias all over your living room!!! Nope. None of that happens. It doesn’t even happen in the most Kwanzaa-y of places. Damn you, Kwanzaa! I love you and I hate what you have --- and haven’t --- become. For those of you not in the know, Kwanzaa is an African-American Winter Holiday that was invented by a black dude in 1966... and that’s pretty much where the story ends. It’s seven days long, starts the day after Christmas, and for each day you light different candle on a candelabra --- Which is probably where the problems between the blacks and the Jews began. Think about it. Black Dude (Maybe Dr. Ron Karenga who invented Kwanzaa): "...Yeah so that’s the story of Kwanzaa. Jewish Guy: "Really? It’s several days long. You light a candle everyday and it happens in December. WOW! Wherever did you get that idea?" Black Guy: "What do you mean?" Jewish Guy: "After all the hard work that us Jewish people did with black people during the Civil Rights Movement, you scoop our holiday?? THIS is how you treat us??" Black Guy: "I don’t understand what you’re getting at." Jewish Guy: "Nothing. Don’t worry about it... In a completely unrelated note, your bank loan has been denied." Despite how it appears, I grew up celebrating Kwanzaa... and Christmas. Every year on the day after December 25th, the Christmas Tree was instantly transformed into the Kwanzaa Bush. See, I had one of THOSE black moms. One of those black moms where you do all this black stuff in the house like studying black history ---- even in months that aren’t February, looking at her slides from Africa every time a stranger comes over for any reason, constantly importing new African art into the house that is already stuffed with African art... And she does this because she knows when you go outside, you won’t be seeing hardly any black/African NOTHING so she tries to overload you before you leave. My mom felt like learning about black stuff in America was like taking Vitamin C during the winter; you quite literally can’t have too much. But now Kwanzaa has gotten weird because somewhere along the way mass media discovered it. And they are using Kwanzaa And now you hear about Kwanzaa in commercials. You know the ones I’m talking about... Where they combine all the holidays names into one big holiday as a way to promote some kind of broken Multiculturalism. “Happy ChrismaKwanakkah!” YUCK! Not that many black people celebrate Kwanzaa. I’d guess maybe 1 percent. 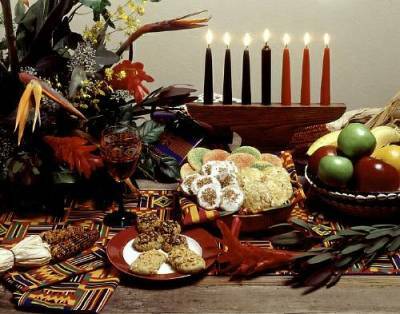 So lumping Kwanzaa in with those other holidays is disingenuous at best and down right dishonest at most. But do you wanna know how you KNOW FOR SURE that as a whole black people don’t celebrate Kwanzaa? Guns, Cars, & shiny stuff... We, black people, like those things, so we have many hit songs about them. Sickle Cell, High Blood Pressure, and Kwanzaa... We don’t like to think about those things too much, so we don’t have any hit songs about them. Again, I like Kwanzaa. I’m part of one of the one percent who grew up celebrating it, and when I have kids THEY will celebrate Kwanzaa. It’s a fun time. Each day is named after a different principle. Umoja(Unity): To strive for and maintain unity in the family, community, nation and race. Kujichagulia(Self Determination): To define ourselves, name ourselves, create for ourselves and speak for ourselves. Ujima(Collective Work and Responsibility): To build and maintain our community together and make our brothers’ and our sisters’ problems our problems and to solve them together. Ujamaa(Cooperative Economics): To build and maintain our own stores, shops, and other businesses and to profit from them together. Nia(Purpose): To make our collective vocation the building and developing of our community in order to restore our people to their traditional greatness. Kuumba(Creativity): To do always as much as we can, in the way we can, in order to leave our community more beautiful and beneficial than we inherited it. Imani(Faith): To believe with all our heart in our people, our parents, our teachers, our leaders and the righteousness and victory of our struggle.